The 1st BIZZin3D Meet Up took place 31 may 2009 in Berlin. Around 80 people joined the Event. Playground for geeks or ready for business solutions? Send link to: info[at]bizzin3d[dot]com . - Bart Bockhoudt, Dutch Exchange, "DX Exchange"
Whit Sunday, May 31st 2009 in the time from 16:00- 22:00. There will be a break between the 2. and the 3. panel and a “come together” after the event with background music. Lydia Gorstein (LydiaGorstein Pearl in Second Life) will play the piano. 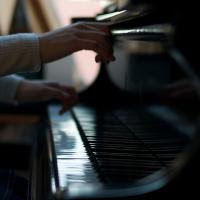 (Pieces of Johann Sebastian Bach, Sergej Rachmaninow, Frederik Chopin and Maurice Ravel). 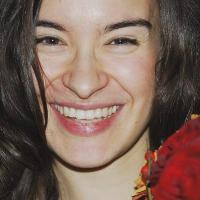 Lydia Gorstein was born 1983 in Moscow. She started playing piano at the special school of music in the Tchaikowski Conservatory at the age of 6. In 1992, she started her studies at the Hochschule für Musik "Hanns Eisler" in Berlin. She played with the Berliner Symphoniker in the Berlin Philharmonic, took master classes from Barenboim and Davidovich and won several prices, including Steinway and Yamaha competitions. She holds several scholarships, including the "Studienstiftung des Deutschen Volkes". 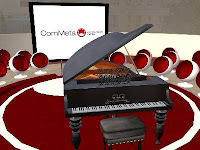 The music will be streamed live to the virtual ComMeta Convention Center in Second Life. The event does completely without PowerPoint presentations but is entirely based on moderated discussion panels. Carefully selected experts and moderators on stage guarantee you solid background information. Send us an Email for requests. BIZZin3D is hosted by YOUin3D.com GmbH. Tel. : +49-(0)30-55 95 94 64. Follow BIZZin3D-Twitter or grab RSS Feed for News & Updates.